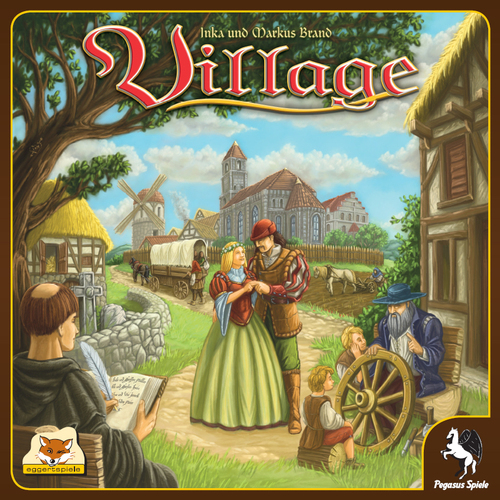 To start off, Village was never a game i really took to after all the times i played it. I owned it and i subsequently traded it away. My gripes with Village was ( to me ) what i perceived as a lack of options in a good board game. I appreciate games which give me a reasonable choices of things to do with also one or two random elements that make each game different or exciting. Of which, vanilla Village had none. 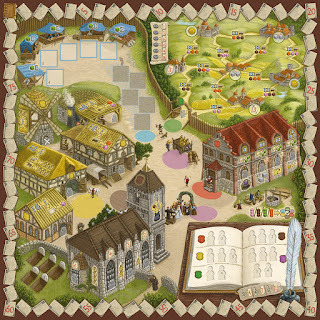 It's only random element was how the market tiles appear each round and the colored cubes placed in each board segment. The seeding of the colored cubes gives a lot of randomness i do agree, but it doesnt really tickle my fancy sufficiently to deem that the game plays differently each time. But the main issue i have are the choices that are offered to me. But in the end of it all, there are only a few of them that give you a path to victory. These are, Market, Church, Travel and Councillor. 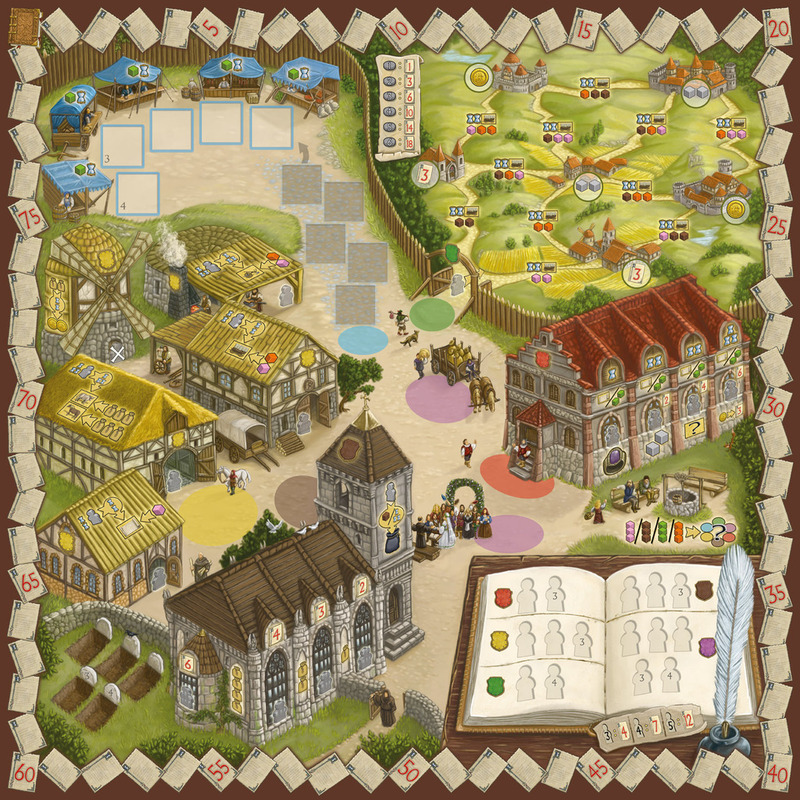 The Marriage segment is to get more workers, the Production and Farming segments are your engine, your means to accomplish all the other tasks on the board. The other way to score points is by having your workers pass away, it is interesting, and it affords you a lot of planning, but it is something that ultimately happens ( just like life ) and you want to be the one who manages it the best over the rest. No one really ignores worker death in a game. It is very heavily contested for. What it really boils down to for me, is what you choose between Market, Travel, Church and Councillor. They give you points ( except market ) for either how many people you have in these buildings at game end, or how far ahead they are in these buildings. They also give you some mid game points or resources as you make your way up the hierarchy. The Market gives you end game points for servicing customers through the selling of goods. I will just let it be known that you cant "master" all these areas in one game. At least i have never seen anyone do so. You will very likely pick 2 of the 4 options and get your toes wet in another 1 of the 2 remaining. But virtually, that is it. So your combination of options boils down to 6 real options. Of which, nothing on the board really changes each game. The values are the same, the rewards are the same. 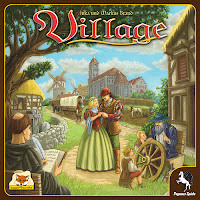 So for me, there was nothing truly exciting after 2 games of Village. I always try different things each time i play a game, and by my third game i didnt feel like i really was excited to see where a certain strategy would bring me. i didnt enjoy it, but i wont say i disliked it. i would play it on request but i would rather something else. with Village Inn, you get 2 new segments to augment the original board. Basically you just place it to cover up certain spots. There is the Brewery that lets you brew Beer. 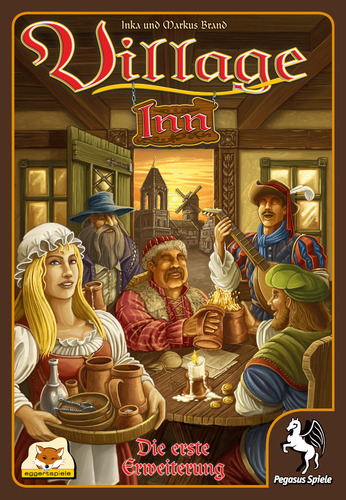 And there is the Beer Inn that lets you use Beer ( or coins in some cases ) to buy customers who give you either resources immediately, in game one time use abilities, or end game bonuses. It also adds a 5th player, customer cards ( of course ) and a new cemetery and book of great honor or whatever the actual term was. I decided to go fully into the Market ( i had only dabble in it before, toes wet ) and pursue a strategy i had never seen anyone do, convert 2 grain into 2 coins. As you can read from Eric's report, i didnt win, was tied for 2nd and got bumped to last as the 2nd place player serviced 1 more customer than me. I did like the money conversion strategy though, it just didnt mesh well with a Market strategy as what you need to plow grain is also what you want to sell at the market. Village Inn surprised me quite a bit. They will make each game different each time as it is very unlikely that you will ever run through all of the cards in a game. And the cards enhance some of the board actions and also give you other ways to obtain points. For example, there are cards that reward you for cubes leftover ( of one type of color ) at the end of the game. But not too much, as there is a limit to the number of cubes they will accept for points exchange. Other abilities include reversing or forwarding the flow of time ( for worker death ), and giving you tiles from the market regardless if you can meet the requirements or not. 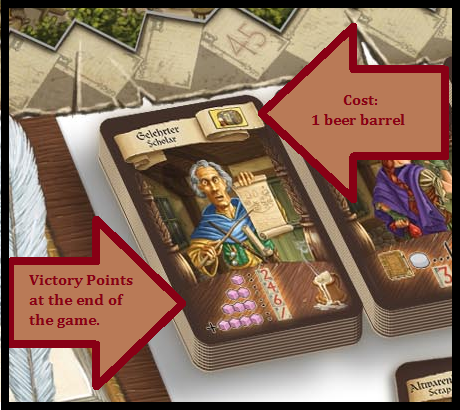 Some of the end game bonuses give you more points in the book of Honor, or more points from extended travel. These make each strategy employed either more efficient, or more worthwhile. Which is great because that means the board no longer seems stale or provide you a fixed ratio of benefits. All in all, i really liked the expansion Village Inn. it is what i think an expansion should be. Adds a new element to the game, helps the game to be different each play, and it gives you more thought on what you hope to do in the game and rewards you for trying something different each time as the abilities can help you to dabble into more areas without over-committing yourself ( and your workers ). 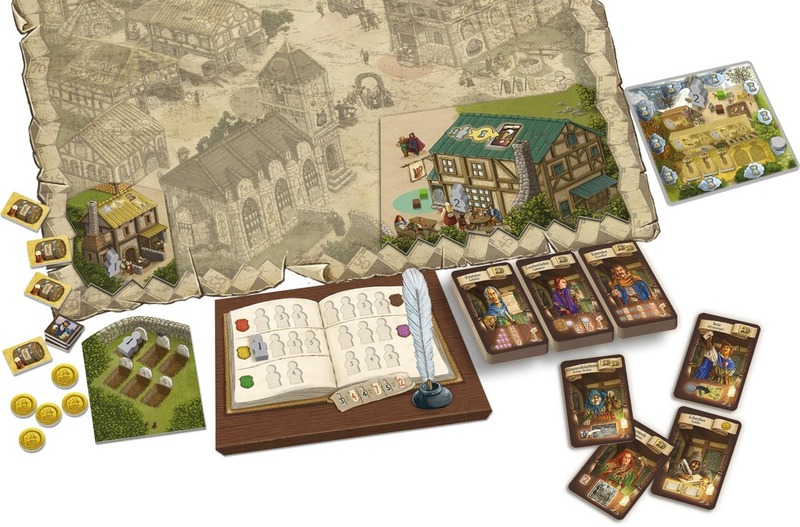 Unfortunately, due to costs, i will not be re-purchasing Village and its expansion. Woah ....... thanks on the review on village inn ....... seem interesting ...... BTW how much would the expansion be? its not very cheap, almost same price (maybe about 90%) of base game Village. Might be cheaper than what we got because we ordered from Germany.